needed by our clients, ensuring prompt production and delivery. Allow cut the plywood 1850x1250mm format with high precision assuring superior quality classic cutting techniques. 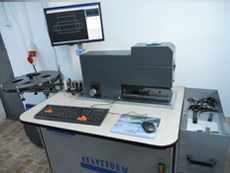 With this latest technology, our company ensures a high precision and quality of punches (mold) produced by STANTFORM. Knives used in the manufacture of processed punches totally automatic, which gives a higher safety and accuracy of punches produced by STANTFORM. products and the services we provide.